Sometimes, small arms fire just doesn't cut it. So when special forces teams around the world need more long-range, tank-stopping punch than a conventional bazooka or panzerschreck can deliver, they give Carl a call. 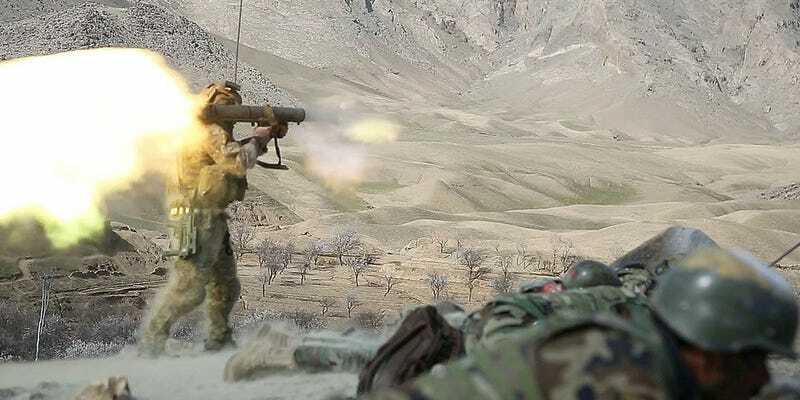 The M3 Carl Gustaf Multi-Role Anti-Armor Anti-Personnel Weapon System (MAAWS) is a shoulder fired, recoilless rifle—yes it's a rifle—originally devised by Swedish defense engineers back in 1948. It features a breech-mounted Venturi recoil damper, dual pistol grips, and iron sights that can be augmented with telescopic image-enhancing scopes. Normally, the weapon is operated by a two man team—one carrying and firing the device, while the other carries ammo and handles reloads—but it can be used solo if the need for serious badassery arises. While the M3 Carl-Gustaf looks quite a bit like its bazooka, PIAT, and panzerschreck counterparts, it offers a number of unique design variations. For one, it fires just like an big-old rifle. Its 84mm bore is rifled, which spin stabilizes its rounds (rather than relying on pop-out fins) and allows for more propellant to be used. This in turn greatly extends the M3's targeting range. Rounds also fly significantly faster—about 290 m/s for the M3 compared to 105 m/s or less for similar weapons—though even this speed is generally too pokey to be of much use against long-range moving targets. Also, unlike the single-serving AT4 anti-tank system, the M3 can be reused. "It operates just like a rifle," Bhuvanesh Thoguluva, chief of the Vehicle Protection, Rockets & Shoulder Fired Weapons Branch of the Munitions Systems and Technical Directorate at Picatinny Arsenal, said in a press release. "After firing, the assistant gunner reloads it, and it can be fired again. On a disposable weapon you will find a maximum effective range of approximately 300 meters, whereas with the Gustaf you are talking about possibly up to 1,700 meters. That's a huge difference." The modern M3 version weighs just under 20 pounds, 11 pounds less than the original M2 iteration, thanks to the liberal usage of carbon fiber and aluminum throughout the weapon body. It can fire up to six rounds a minute using a two-man team. The M3's ease of use, durability, and the destructive power of its 6-pound multi-function warheads have made it a the most popular choice for squad-level anti-tank operations among many West European armies. It has also been extensively used by US Special Forces (Army Special Forces, 75th Ranger Regiment, Navy SEALS, Delta Force, DEVGRU, and MARSOC) since being introduced in 1991.